Why does it always seem like the words “style” and “minivan” just don’t seem to mesh well together? That minivans have to be these monstrosities that can seat seven comfortably, but it’s like someone told the designers, “Ok we need all of this, but it can’t look good doing it.” One company thinks this trend needs to end, which leads us to the 2015 Kia Sedona in High Point NC. 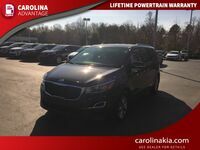 The 2015 Sedona is available at Carolina Kia in a number of different trims, each offering its own individual set of features and qualities. One thing that all of the vehicles have in common, though, is the 276-horsepower, 3.3-liter V-6 engine under the hood, that cranks out an impressive 248 pound-feet of torque. With this, the vehicle can achieve up to an EPA-estimated 18-mpg city, and 25-mpg highway. Interested in a 2015 Kia Sedona? 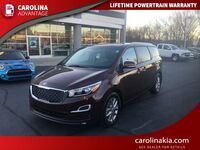 After a redesign from its 2014 model, the 2015 Kia Sedona in High Point NC looks like a whole new minivan. With a wider, more aggressive looking front grille and a much more defined hood, the Sedona is a minivan that does everything it needs to, and looks good doing it. In addition, the wheelbase was given an almost two inch increase while the length was kept almost the same. This gives the new Sedona a longer middle section of the vehicle, which looks much more upscale than its previous model. And when equipped with available 19-inch chrome finish alloy wheels, the 2015 Kia Sedona is one of the best looking vehicles on the road, and not just including minivans. On the inside of the 2015 Kia Sedona in High Point NC you will find one of the most spacious minivan interiors around. As the wheelbase was expanded, this allows more room for the passengers in the second and third row. With over 40-inches of legroom in the first and second rows, and a still relaxing 34.8-inches in the third, there is comfort throughout the entire vehicle. 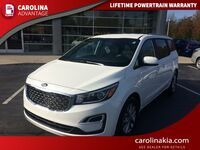 As you and your passengers are riding along comfortably in a 2015 Kia Sedona in High Point NC, you will also know that everyone is safe and secure should the vehicle be involved in an accident. The 2015 Sedona was selected as a 2015 IIHS Top Safety Pick, thanks to systems like electronic stability control, cornering brake control, rear camera display, a backup warning system, and available features such as blind-spot detection and rear cross traffic alert.